How can we find out what life was like during the Victorian times? The quality of life depended on whether you were rich or poor. If you were rich you could have a good and easy life. But if you were poor you could have a rough and hard life, often ending up in the workhouse or early death. How many children did a normal Victorian family have? Families were usually large, in 1870 many families had five or six children. What did child call his/her father? Each member of the family had their own role and children were taught to "know their place" and "be seen and not heard". They called their fathers 'sir'. Who did the house work in rich people’s houses? All households except the very poorest had servants to do their everyday work. 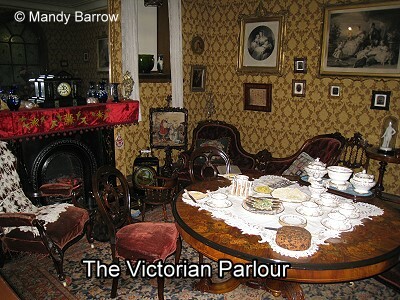 Region was very important to the Victorians. A great number of people went to church, at least once and probably twice, every Sunday. At the beginning of the Victorian period, people relied on the foods that were in season and available locally or those which had been pickled or preserved. Later, when the railways were built, many new and fresh foods to the towns and cities. The invention of the steam ship, and of transport refrigeration, meant that also meat, fish and fruit could be imported from overseas quite cheaply. There were no fridges and freezes in the homes to keep food for a long time, so meals were limited by the available local food supply or food which had been pickled or preserved. People did not buy their food in a supermarket instead they went to several small shops, all selling different types of food. Grocers’ shops sold dried goods such as tea, coffee, sugar and rice; butchers’ shops sold meat; and dairy shops sold milk, cream, eggs, butter and cheese. Basic foods were: beef, mutton, pork, bacon, cheese, eggs, bread, potatoes, rice, oatmeal, milk, vegetables in season, flour, sugar, treacle, jam and tea. Enormous railway stations remind us that railway was new and an important form of transport. We can study Victorian maps and documents, such as the forms that were filled in during the census. Photography was invented during Victoria's reign, so people could now record on film what daily life was like.